pioneer wrote: Are you all going to ensure the safety of everyone and everything isn't compromised this time? Are your members of staff going to be armed with rocks? Is a carpark an ideal "racing" area? Why don't you all get a real track to show off your skills? (1) Sir pioneer, considering that this cap park is not fully gated there will be some issues. As for your concerns over animals crossing the race area, rest assured that when this has occurred there has never been an incident to warrant such a over exuberance of fear. I myself have encountered more 2 legged animals driving on the public roads on a daily basis just trying to get to work and going to D&W. I would tell you ask Chief Justice Kangaloo (RIP) but you are to late. (2) Your request for a real track. Please address this concern to the The Governing Body for MotorSport (TTASA), whom is charged with the initial responsibility to provide. Their meetings are held every 2nd Wednesday of the month in central, there you can raise ALL HELL and then give us the 411. Meanwhile AutoSport is a private organisation that is trying to keep the sport alive at their own expense, but if you have about 20 million to spend for a track I an sure they will gladly accept your gratitude, and if all fails I have Anil Robert's phone number to call. Ps, Please reply to say where they can pick up the millions for the track which will solve all your issues. before we award the super troll achievement, which you've obviously unlocked, it requires that you spend a month in bantanamo. But watch out He/she/it buff-proof and will resurface like a cyborg. Meanwhile we move on in our "car-park" that attracts more than 70 of a wide cross-section of a very committed motor-sport competitor making the best of what is available at this point in time. How and where did the Daytona Motor Sport develop? And where is it today? If all of the moderators take a stand on this character, maybe those who are intent on building motor sport within the confines we have to operate, will be able to keep our focus and eventually make that breakthrough that is inevitable. And I predict that we are almost there! Autosport there is need to attack me, I am not your enemy here. I asked two very legit questions based on concerns other people share but too afraid to say. You are yet to answer them, please do. Matter of fact, many NGO's besides trinituner are waiting on your answer as they are fully aware of the situation and have witnessed the attitude you are displaying. When you sir, continue to feel that you have unfettered licence to post this type of crap on almost a daily basis, you have no right to ask anyone for any explanation, and I quote you: "These animals want respect? Jobs? Then when they come to work for 10am and leave 2pm, do nothing all day then want to make chets saying "u enno wey I from oar?" Seriously, bomb that entire area. Or time for biological warfare"
But wait, like that was a diversion by this strange attention-sapping character. So we move on and looking at making some changes to the course, but that would also mean addressing the break-out times in the B Class, so we shall see how this will also unfold. perhaps because perception isn't fact. what constituted the safety of everyone and everything being compromised? I've never seen, nor know of anyone being issued rocks. poor defenseless pioneer. the trolling level is magnificent. inside the car park pelting stones and pretending i going fast on Sunday. 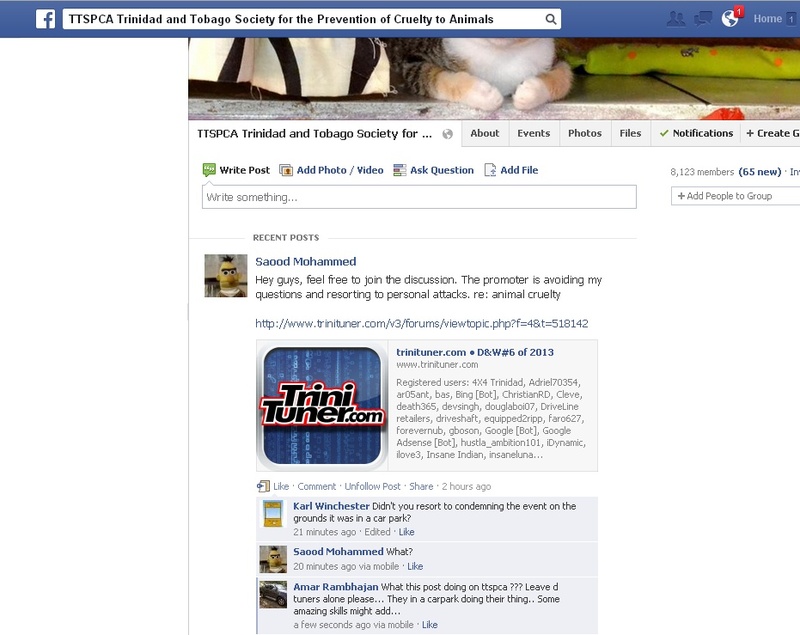 whats the point of posting on the TTSPCA page anyway saood? 40 likes and they buy you a new EDM cd? that group is a waste, if they really cared about animal cruelty, they should be providing homes for all them stray mongrel and pothound. The arrogance displayed by the "racers" is amazing. Then you all expect government funding and recognition? I'm actually trying to help you all here, but good luck anyway. You have to excuse them, it's easier to attack pioneer and collectively gipgip under a tent. lemme challenge you to a run na? Nah tr1ad all kicks aside, all I wanted was an answer to two very simple questions. wagonrunner answered your two questions..
still, no one is sure who or what compromised the safety of 'everything and everyone' at previous events as alleged by you. please elaborate to deserve a legitimate answer. Wrt the second question, staff are expected to provide their own projectiles or arrive early to collect your own at the fence perimeter. the subject of your subsequent aim, is of personal preference. the questions you posed pioneer, really warranted nothing more than the responses you received eh..
even by your standards, they were dismally dumb and poorly trolled. Razkal, are you and wagonrunner promoters of the event? My questions were directed at Autosport. Instead of trying to act as the promoter, address the issues that were highlighted to you earlier this week on another website. pioneer wrote: Razkal, are you and wagonrunner promoters of the event? what my answers not legitimate enough for you? i start on topic: autosport does a great job or organising the event, and dissipating information based on available resources, that's why participants like myself and wagonrunner, can be informed. informed enough to try answering questions, even the silly ones like yours. i end off topic: what site? you mean where ilovebeti insinuated i'm bald and skinny on FB? you think i'm twelve and affected by that ish?? I just need to know if sr20vvlolz going to be there an what class he is in, I have to come beat him to defend the honor of the Nugyamyam people! pioneer wrote: The arrogance displayed by the "racers" is amazing. "These animals want respect? Jobs? Then when they come to work for 10am and leave 2pm, do nothing all day then want to make chets saying "u enno wey I from oar?" Seriously, bomb that entire area. Or time for biological warfare." You are the one who needs serious help, from the above comments, and now you switch your attack to the arrogance displayed by the “racers” and I again suggest you quickly find your way back to your religion and start to fast before the end of your Holy Month. When we spend days blowing away all the pebbles and sand on the track, to provide a safe racing surface in the ”car park”, where will our people find a big stone to throw at a dog? Seeing that you are so passionate about saving the poor dogs, you should be parading up and down our highways trying to save those dogs that are slaughtered on a daily basis, instead of living here on Tuner jumping into practically every single thread that is posted, and making those asinine comments and exposing your self. Just take the people Award and go get a life! Last edited by AutoSport on July 21st, 2013, 7:33 pm, edited 2 times in total. pioneer wrote: Nah tr1ad all kicks aside, all I wanted was an answer to two very simple questions. Razkal wrote: wagonrunner answered your two questions.. The questions you suggest and mandate answer for is considered both laughable and ridiculous, and does not deserve a response, in view of the fact that T&T is without a proper racing facility so we use what we have. Dogs and goats have been in attendance at events since Walla Field, where were you then ? Situations similar occurred earlier this year in St Lucia and most recently in Grenada with Drag cars travelling at 130 mph plus. Why don't you offer a solution to this phenomena that exist regionally, but just remember your prerogative is just don't attend any events at all so you wouldn't get bite. Please let us move on with any real racing questions. Rawle now that gonna be a tough one. The capri is being prepped for the meguiars show already and at the same time we running drag and wind. Great! Not sure eh, but this is posted above. Wonder if his mother and father know what he is doing in his full time, not spare time?? Team Loco wrote: Rawle now that gonna be a tough one. The capri is being prepped for the meguiars show already and at the same time we running drag and wind. Great! Last D&W Event - 1st place AND 3rd place. Last Meguiar's, was it 2nd or 3rd place? Imagine Meguiar's 2013 and D&W#8 - first in both! They might want to send the Locost foreign! we placed second in the last meguiars show. since then the capri has been in the shop being fine tuned for this event.